Our puppies are so cute and need lots of attention. 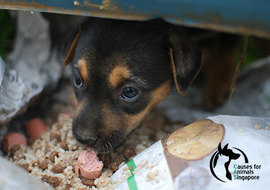 Please consider joining our Puppy Club to help these little guys. All our Puppy Club puppies are available for adoption. We are also looking for caring foster families. Please contact info@causesforanimals.com if you want to adopt. Ever wondered how it would feel to be born into a world where all you could feel was the hard rough concrete or sand beneath your tender little body? Ever wondered how it would feel to be exposed to the elements as a tiny little being? Ever wondered about the horror of not knowing when your next meal would be? Ever wondered how it would feel if mummy promised to return but never did? Ever wondered how living out in the storms and under the blazing hot sun would feel? We don't want the innocent to suffer. You can help a street puppy today. Join the CAS Puppy Club! 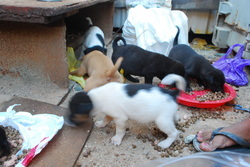 Our main aim is to get the puppies a forever loving home. A large percentage of people adding a dog to their household will look for a puppy. Puppies are CUTE and we have a much higher success rate of adoption with them. Puppies born into a construction site. Be a Puppy Club Champion! Monthly donations go towards, food, including special diets, healthcare such as vet visits, vaccinations, worming, flea and tick treatment, heartworm preventative and also goes towards any adoption costs, transportation and rehabilitation training if needed. You will receive a monthly update on the puppies in the Puppy Club of all their adventures! CAS is a registered charity and an Institute of Public Character (IPC) in Singapore. Donations made to us are entitled to tax relief if your Tax Reference Number (NRIC/FIN/UEN) is submitted to us at time of donation. More info. For Paypal donors who do not enter their TRN: the confirmation sent by Paypal will be an acknowledgement of your donation. No CAS e-receipts will be issued. The Puppy Club supports as many puppies as we can. We focus on getting puppies adopted out as quickly as possible so some puppies may not be with us long. This makes it too hard for individual sponsorship, but we are happy to update you on a particular puppy at your request. Our Puppy Club also includes puppies from other organisations and we pass on funding to them monthly to help with their costs. We treat all animals in our care equally whether sponsored or not. 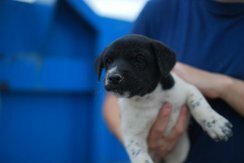 Your gift is used to help all our street puppies in need.